Sounding the shofar in the synagogue on Rosh HaShanah is the high point of my year. How to BlowNo other mitzvah in Judaism is so dependent on a personal skill or entails such high drama. And, at least for me, no other mitzvah renders quite the same sense of achievement and fulfillment. I often hear people talk about the awakening power of the sound of the shofar – how awesome a moment or how inspiring an experience it is for them to hear it. For me, it is both a very public and an intensely personal experience. As I approach the bimah, I find myself quite alone, concentrating intently on what I have to do. Yet I am also highly conscious of being surrounded by hundreds of people who are relying on my ability to enable them to fulfill the central observance of the day. In Numbers 29:1, the Torah designates the first day of the seventh month, that is Rosh HaShanah, as “a day of blowing the shofar.” The Oral Law, as interpreted by the rabbis, sets out a number of regulations concerning both the instrument itself and the manner in which it is to be sounded. 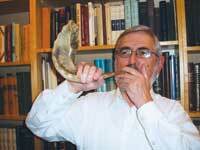 The shofar must be fashioned out of a ram’s horn. With the smaller end cut off, the horn is straightened out a little by heating it, so that a hole can be bored through it. A mouthpiece is formed out of the horn itself. No finger holes or reed or valves – such as you would find on other wind or brass instruments – may be added to help vary the notes. Thus, the only control you have over the notes is how you use your lips and your tongue. To produce a note, first use your tongue to moisten the extreme right-hand corner of your lips, and place the shofar firmly against them in that spot. With your lips tightly closed, make a tiny hole in them where the shofar is, and then force air into it as if you were making a Bronx cheer (a rasping sound), but without actually producing such a rude noise. If you get it right, a bright and powerful note will emerge from the shofar. The tighter you squeeze the shofar against your lips, the higher the note that you will sound. It’s not necessary to puff out your cheeks; breathe in and hold the breath in your chest, letting it out slowly to control the length of the note. The sequence and the length of the notes must follow the established pattern with great accuracy. The three mandatory sounds are designed to awaken thoughts of repentance and of subservience to God in the mind of the listener. First comes the teki’ah, a long, clear note of alarm. This is used to bracket each of the other sounds, which are meant to be evocative of crying. The shevarim, a three-part note, suggests the sound of sighing or moaning. The teru’ah, consisting of nine rapid-fire staccato sounds, dramatically echoes the sobbing of someone in despair. One hundred notes, in various combinations, are sounded at intervals throughout the Rosh HaShanah service, and each set is capped by a teki’ah gedolah, an extra-long note in which many also hear a sign of strength and hope. Not too many people persevere enough to become really proficient at blowing the shofar. Many of those who do learned the skill from their fathers at a very young age, as I did. But each year, it takes much practice over a month or so both to perfect the notes once again and to retool the muscles of the lips and the strength of the lungs. Since there’s no real way of controlling the quality of the shofar’s sound, you can never be 100 percent confident that the right sound will emerge. So whatever spiritual thoughts I might try to have as I prepare myself to sound the shofar usually evaporate as I begin, and I am left simply hoping that, despite my trepidation, the notes will come out as perfectly as they did when I was practicing. Yet being in control of the shofar’s power is an extraordinary privilege and responsibility. Sometimes I like to think that the next teki’ah or the next shevarim could be the one that carries the congregation’s prayers soaring to the heavens. Sometimes I pray that this wordless animal sound that I am producing will have the ability to take the place of the prayers that are unspoken – those that words are inadequate to express. I will not deny that I enjoy the congratulations and the handshakes that are offered to me after I sound the last teki’ah gedolah. And what am I thinking at this point, when it’s all over? That in just one year, with God’s help, I will get to do it again.